An analyst firm has chimed in on 2018 iPhone rumors, adding the possibility that Apple Pencil support may be coming to the high-end releases in the fall. The company expects that the the 6.1-inch LCD version will come with Face ID, Dual-SIM technology. The firm expects it to retail for between $699 and $749. The 5.8-inch OLED iPhone will be priced at $899 to $949. The 6.5-inch device will come in storage capacities up to 512GB, with one variant of the size potentially having dual-SIM support and ex expected to be "limited within $1,000 threshold as to encourage purchasing from consumers" according to Trendforce. Trendforce isn't clear what specific models will get Apple Pencil support, saying that it will be "offered as an option." Both the 5.8- and 6.5-inch OLED models are expected to have 4GB of RAM. 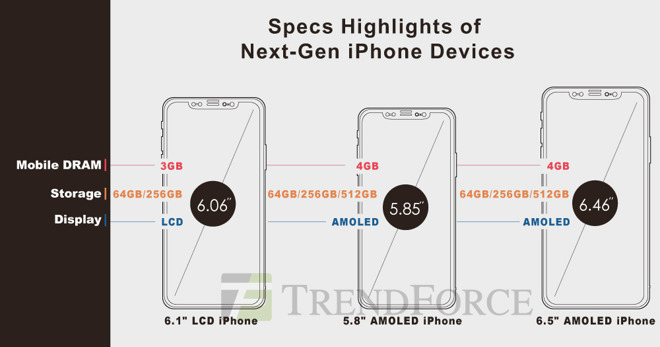 The 6.1-inch LED devices will have 3GB of RAM, the same as the iPhone X. The analyst firm believes that all three models are expected to ship in September and October. Rumors about the new devices started in January. More recently, pricing information has pegged the 5.8-inch OLED model as costing between $800 to $900. The 6.5-inch OLED "iPhone X Plus" priced between $900 to $1000. The LCD model is likely to be between $600 to $700, according to the supply chain. As of late, there have been alleged front glass leaks, and mockups floating around the Internet of the same sizes as predicted by Trendforce. Other than the Apple Pencil claim, the report by Trendforce doesn't seem to be based on any new information. Instead, like previous reports by the firm, it appears to be an amalgam of data from several sources. Additionally, Trendforce is repeating the "lower than expected" and "fallen short of the high expectations" line for iPhone X sales, without addressing which metrics are being used for the comparison.